As usual, avoid very high and very low resistor values, to avoid measurement errors caused by meter "loading" (on the high end) and to avoid transistor burnout (on the low end). I recommend resistors between 1 kW and 100 kW. Why is it common for amplifier circuits to use multiple stages of transistors, rather than just one transistor (or two transistors in a push-pull circuit)? Describe some of the benefits of using multiple transistor stages. I'll let you research the answer(s) to this question on your own! A fairly simple question, but useful to discuss nevertheless. Also, be prepared to explain what the effect of any one component's failure (either open or shorted) will have on the output signal. The answers given in the Änswers" section are minimal: just enough to help students who may be struggling with the concepts. During discussion, I would expect more detail than these short phrases. Be sure to challenge your students with hypothetical component failures in this circuit. Make sure they comprehend each component's function in this circuit, beyond memorizing a phrase! 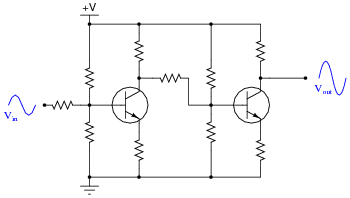 Explain what purpose these resistors serve in a paralleled transistor network. And what exactly does ßwamping" mean, anyway? Swamping is a design term, meaning to introduce a quantity or quantities into a circuit such that any intrinsic differences between components become insignificant in comparison. In this circuit, the swamping resistors help ensure that the total controlled current is more evenly split between the three transistors. Follow-up question: can you think of any disadvantages to using swamping resistors in high-power circuitry? I once had the misfortune of performing component-level repair on a large power inverter (208 volt, three-phase) that used large "banks" of directly paralleled bipolar transistors for the final switching elements. These inverters had a bad habit of destroying transistors, and I noticed that invariably there would be only one or two transistors out of about a dozen on each heat sink rail that were blown - and I mean blown, holes blasted through the metal TO-3 cases! - while the rest were perfectly fine. These transistor banks did not employ swamping resistors, and so the current distribution between them was quite unbalanced. In case students ask, you should let them know that swamping resistors are not just used in transistor banks. Large rectifier diode banks (where multiple diodes are paralleled) also benefit from swamping resistors. As for applications where swamping resistors are impractical, it is possible to gain better reliability by using more transistors (or diodes) than necessary with an even current split. In other words, over-build the circuit. Explain why MOSFETs do not require swamping resistors to help evenly distribute current, while BJTs do. The amount of controlling voltage varies with temperature for the BJT, but not for the MOSFET. The answer given here is purposefully vague. Let your students do the necessary research! Tell them that manufacturers' application notes are valuable sources of information for questions such as this. 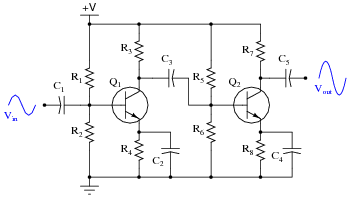 The first amplifier circuit shown here is direct-coupled, while the second is capacitively coupled. Which of these two designs would be more suitable for use in a DC voltmeter circuit (amplifying a measured DC voltage)? 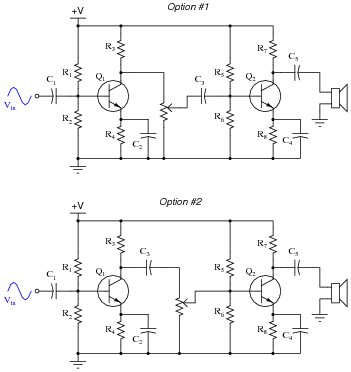 What applications would the other amplifier design be suited for? The direct-coupled amplifier circuit's bandwidth extends down to 0 Hz, unlike the other amplifier. This makes it suitable for DC signal amplification. The capacitive-coupled amplifier circuit would be better suited for applications where AC signals are solely dealt with. Follow-up question: in each of these amplifier circuits, identify the point at which the signal's phase becomes shifted by 180o. In other words, show where the voltage signal becomes inverted, and then inverted again, so that the output is in phase with the input. A good question to ask your students is, "What is bandwidth?" It is important that your students understand the basic concept of "bandwidth", and what factors influence it in a circuit. Ask your students to suggest possible values (in microfarads) for the coupling capacitor in the second circuit, based on common resistor values (between 1 kW and 100 kW), and a modest audio frequency range (1 kHz to 20 kHz). No exact values are needed here, but it is important that they be able to make an approximate estimation of the necessary (minimum) capacitance, if for no other reason than to demonstrate their comprehension of the coupling capacitor's intended purpose. 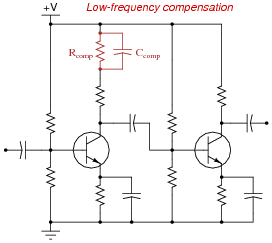 Explain how the presence of this "compensating" capacitor helps to overcome the loss of gain normally experienced as a result of the other capacitors in the circuit. The additional capacitor's rising reactance at low frequencies boosts the gain of the first transistor stage by increasing the impedance from the first transistor's collector to the +V power supply rail. 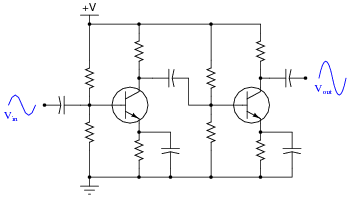 This technique is commonly used in video amplifier circuits, although a complete video amplifier circuit would not be this crude (no peaking coils). What advantage(s) does a transformer-coupled amplifier have over circuits using other methods of coupling? Are there any disadvantages to using a transformer for signal coupling between transistor stages? Explain in detail. Transformers allow for impedance transformation between stages, as well as phase inversion (if desired). However, their parasitic (leakage) inductance and inter-winding capacitance may cause the amplifier to have strange frequency response characteristics. 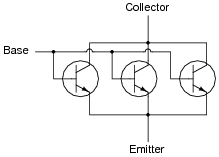 Follow-up question: label the transformer's polarity using "dot" notation in order to achieve no inversion of signal from input to output (as shown). Ask your students to explain what impedance transformation is and why it is important, especially in amplifier circuits. This will be a good review of both transformer theory and the maximum power transfer theorem. 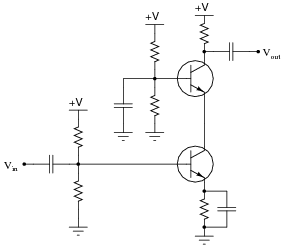 Regarding phase inversion, a fun challenge here is to have students specify the "dot convention" necessary for this particular transformer to obtain the non-inverting characteristic of this two-stage amplifier circuit. In other words, have them draw dots near the transformer windings (with the proper relative relationship) to produce the phasing shown by the sine-wave symbols in the diagram. Which option would be better, and why? What ill effects could result from locating the potentiometer in the wrong place in this circuit? Option #1 is definitely the better choice, because the potentiometer's setting will not affect the biasing of Q2 as it would in option #2. The purpose of this question is to make students realize that the biasing of each transistor stage is important in a multi-stage amplifier. One of the major challenges of designing a multi-stage amplifier is to ensure adequate signal coupling between stages without creating bias problems. Radio-frequency amplifiers often use small inductors called peaking coils in the coupling circuitry between transistor stages. Describe the purpose of these inductors. Peaking coils are added to amplifier circuits to help counteract capacitive reactance at high frequencies. The answer I gave for this question is very minimal, and is just enough to give your students a hint. Ask your students to explain why capacitive reactance is an issue in high-frequency transistor amplifier circuits, and why an inductor would be used to counter XC. Also, ask if there are any disadvantages to inserting peaking coils into amplifier circuits. 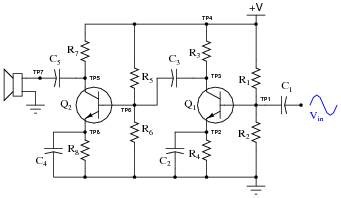 Unlike complementary-pair push-pull amplifier circuits, this circuit absolutely requires a preamplifier stage called a phase splitter, comprised here by transistor Q1 and resistors R3 and R4. Explain what the purpose of the "phase splitter" circuit is, and why it is necessary to properly drive the power transistors Q2 and Q3. Hint: determine the phase relationships of the voltage signals at the base, collector, and emitter terminals of transistor Q1, with respect to ground. A "phase splitter" circuit produces two complementary output voltages (180o phase-shifted from each other), as necessary to drive the power transistors at opposite times in the audio waveform cycle. 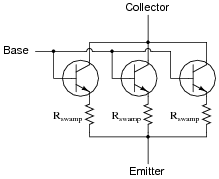 Follow-up question: typically, the collector and emitter resistors of the phase splitter circuit (R3 and R4 in this example) are equally sized. Explain why. Ask your students to qualitatively analyze the voltage signal waveforms at all parts of this circuit. When does Q1 conduct current? When does Q2 conduct current? 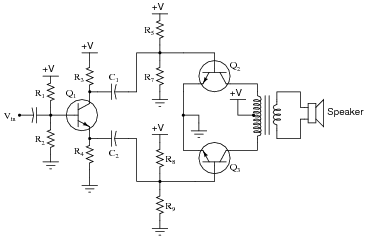 Also, discuss the operational class of this amplifier circuit. Is it Class B, or Class AB? What would need to be changed in order to shift the circuit's operational mode? Explain to your students that this circuit topology was very common in the days of electron tube electronics, when there was no such thing as complementary active components (i.e., NPN versus PNP). Triode, tetrode, and pentode tubes are all positive-driven devices, conducting more current as the grid voltage becomes more positive. Thus, the only way to make a push-pull amplifier with electron tubes was to use a pair to drive the center-tapped winding of an audio power transformer, and use a phase splitter circuit to drive the two tubes. Most modern (semiconductor) audio amplifier designs avoid the use of an audio output transformer. Ask your students why they think this may be the case. How is phase splitting accomplished in this circuit? What is the purpose of resistor R1? What would happen if resistor R1 failed open? What would happen if the wire connecting the base of transistor Q2 to the input transformer (T1) were to fail open? The input transformer T1 provides phase splitting. R1 establishes the Q point of both transistors. If R1 failed open, both transistors would go into cutoff mode. If the wire connecting the base of transistor Q2 to the input transformer (T1) were to fail open, one-half of the output waveform would become clipped. Ask your students to give detailed reasons for their answers. The answers provided for this question are minimal - it is your job as the instructor to ensure students are thinking their way through this question, and not just repeating something they've read or heard from others. Explain a logical, step-by-step approach to identifying the source of the problem, by taking voltage signal measurements. Remember, the more efficient your troubleshooting technique is (the fewer measurements taken), the better! I'll let you have fun determining your own strategies here! This question can easily occupy a large portion of your discussion time, so be sure to make room for it in your schedule! A great way to help students grasp the concepts involved in this circuit as well as improve their troubleshooting technique, is to make a large-scale demonstration board of this circuit, which you can fault on the back side by disconnecting wires, opening or closing switches, etc. Then, have the students take an oscilloscope and practice finding problems in the circuit by voltage measurement only. I have built similar demonstration boards for my own classroom, and have found them to be extremely useful in building and assessing troubleshooting skills. What advantage(s) does the cascode amplifier have over "normal" single- or multi-stage amplifier designs? What, specifically, makes it well suited for high-frequency applications, such as RF (Radio Frequency) signal amplifiers? The combination of a common-collector first stage and a common-base second stage significantly reduces the debilitating effects of interjunction capacitance within the two transistors. Most cascode amplifiers require no neutralization, either: a testament to the effectiveness of the design. This is one of the few popular applications for the common-base transistor amplifier configuration, and it is a solution that has been implemented with field-effect transistors as well as bipolar transistors (and even electron tubes, before that!). Ask your students to explain how the circuit works, especially noting the voltage gain of each stage, and the locations of interjunction (Miller-effect) capacitances in the circuit. With no emitter swamping resistors anywhere in this circuit, the voltage gain of each stage is guaranteed to be large, but unstable as well. With three stages arranged like this, one feeding into the next, the final voltage gain will be very large, and very unstable. This approximation holds true for large variations in individual transistor gain (b) as well as temperature and other factors which would normally wreak havoc in the circuit with no feedback resistor in place. Describe what role the feedback resistor plays in this circuit, and explain how the addition of negative feedback is an overall benefit to this circuit's performance. Also, explain how you can tell this feedback is negative in nature ("degenerative"). 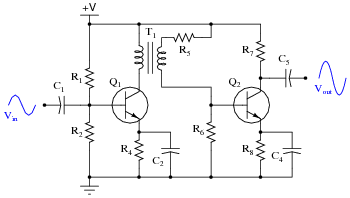 The feedback resistor provides a signal path for negative feedback, which "tames" the unruly gain and instability otherwise inherent to such a crude three-stage transistor amplifier circuit. We can tell that the feedback is negative in nature because it comes from an odd number of inverting amplifier stages (there is still an inverse relationship between output and input). Follow-up question: how much effect do you suppose the replacement of a transistor with a slightly different b or r�e parameter would affect each circuit? Although the circuit shown is a little too crude to be practical, it does illustrate the power of negative feedback as a stabilizing influence. The question regarding the de-generative nature of the feedback is an important one. Discuss with your students how one could not simply pick up the feedback signal from anywhere in the circuit!